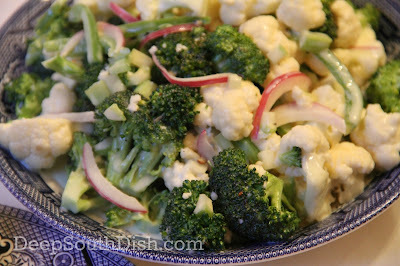 A well loved salad in the South, made from fresh broccoli and cauliflower, sweet green bell pepper, red onion, celery, and a sweet and sour dressing, with just a touch of Deep South flair. I love this salad. I don't even mind the rawness of the broccoli that usually bothers me with broccoli salad, I guess because its offset by the addition of cauliflower. My anti-veggie hubby won't eat this his salad of course, but it keeps great for days in the fridge, so I make it up and eat on it all week where it just keeps getting better. There are quite a few varieties of this salad around, some even including cheese, bacon and nuts and more like that fabulous broccoli salad we all also love. I prefer mine with simply fresh broccoli and cauliflower, chopped celery and always thin strips of red onion and sweet green bell pepper. Have I mentioned I love this salad? Here's how easy it is to make it. Trim, chop into small bite-sized pieces, and rinse the broccoli and cauliflower. Whisk the dressing ingredients together in a large storage bowl. I use vegetable oil, real mayonnaise, granulated sugar, apple cider vinegar, Creole or yellow mustard, salt, pepper and Cajun or Creole seasoning. Add the chopped celery, and very thinly sliced red onion and bell pepper, and gently fold the dressing into the vegetables. Taste and adjust seasonings and refrigerate several hours or preferably overnight, before serving. Whisk the dressing ingredients together in a large storage bowl. Add the vegetables and gently fold dressing into them. Taste and adjust seasonings. Refrigerate several hours or preferably overnight. Cook's Notes: I prefer this salad without, but some folks enjoy tossing it with cheese, bacon and/or nuts. Add 1 strip of bacon, cooked crisp and crumbled, 1/4 cup of shredded or cubed cheddar cheese, and a few tablespoons of chopped nuts or sunflower seeds, just before serving. Hey Ms Mary, have you ever 'steamed' the broccoli in the microwave? I only do this with the florets, cause I feel ya with the weird raw broccoli texture, but the stems are my favorite. Just a minute or two in a covered bowl in the microwave, and you still get the awesome raw, fresh, broccoli sweetness with the raw stems. I love raw cauliflower too. I am SO HAPPY some other human shares my disenchantment with raw broccoli florets. I don't know what it is about broccoli but I'm with you on that raw factor!! Thanks for the tip too! This is an awesome salad for us purists who love these vegies raw with a simple dressing!